To ensure that our customers can conduct their business communications with confidence, Chatwork operates a service that pays close attention to security from various angles ranging from the construction of information management systems to security auditing. Chatwork has concluded a business partnership with KDDI Corporation and jointly developed enhanced security and management functions that can be used even in large organizations. These security standards and management functions are suitable for organizations of all sizes, from small to medium enterprises to large enterprises and government agencies. As of the end of March 2019, more than 214,000 companies are using them. Some internet services carry the risk of communications being tampered with or viewed by third parties while in transit. All communications in Chatwork are encrypted using SSL/TLS, meaning that third parties cannot see their contents. In addition, uploaded files are encrypted using the high-grade encryption method AES 256. SSL is short for Secure Socket Layer. SSL is a mechanism to encrypt the contents of communications to ensure privacy and data integrity, widely used on web pages that offer online payments and the like. TLS is short for Transport Layer Security, and it is standardized based on the latest version of SSL. On Chatwork, protocols that are deprecated because vulnerabilities have been discovered in them (such as SSL 2.0/3.0) cannot be used. The valuable information we collect from customers is managed with an eye towards respecting customer privacy and safeguarding information. The information can be accessed only inside our company with its strong security system, only by select personnel, and only for the purpose of system maintenance. We will not disclose customer data except in certain specific circumstances, such as when customers consent to the disclosure or when we are required by law to disclose data. 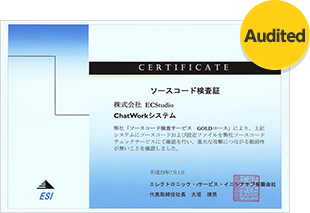 Chatwork has obtained ISO 27001 (ISMS) (*1) certification, an international standard also used by major security companies, etc., ISO 27017 (*2) certification, an international standard for the provision and usage of cloud services, and ISO 27018 (*3) certification, an international standard for personal information protection in the cloud. Chatwork operates according to strict security standards. In addition, we periodically audit things such as the structure of the Chatwork program inside and outside the company to detect any security issues. We also monitor our servers on a 24-hour basis, and system personnel is immediately notified of any abnormalities that are detected. An international standard for adequately managing various risks related to information held by organizations to increase the value of the organization. A practical international standard defining guidelines for preventive measures against various cloud-related risk factors to realize "cloud security" that will be indispensable in the age to come. An international standard to certify that a perfect system is in place for protection of personal information in the cloud, comprehensive internal controls within companies that manage such information, management processes, and so on. Chatwork makes use of Amazon Web Services (AWS) data centers. AWS is a data center service provided by Amazon that is designed, built, and operated based on the company's long experience of operating large data centers. These data centers are certified and recognized as extremely reliable and have an excellent track record. AWS servers are deployed across different data centers with independent power, air conditioning, and networking environments. Even if a hardware failure or network failure occurs in a specific data center, continued operation is assured because the service automatically switches to a waiting server in another data center. Data in the database is always backed up, so data can be restored in the unlikely event that data loss occurs due to a mistake by the system administrator or the like. Additionally, backup data is stored on the dedicated server of a system that is completely separate from the operations server. We use Amazon S3 for storing backup data. Amazon S3 is designed to provide 99.999999999% durability of objects over a given year because it stores data redundantly across multiple facilities. For more details about Amazon Web Services security, please visit the AWS security center.